The brown is going to be nice. I hope it is not UPS brown, but coyote brown. It is planned to be coyote! Topic: Where to sell my Spyderco knives? 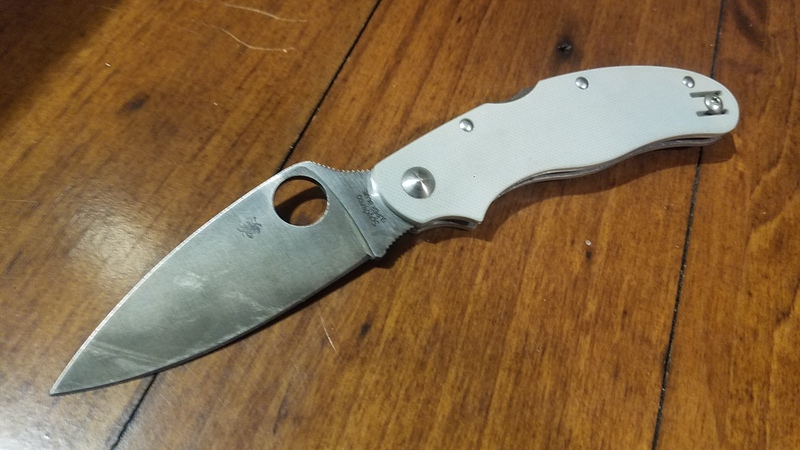 Re: Where to sell my Spyderco knives? Sal was right, there are folks from all over the globe on here. There is something off about the blade shape and/or the flipper tab. It is much different than the 1. Whether it's a recurve or not, the area where the blade and tab meet just looks odd. I might need to wait and see what people think before jumping in too. Very sleuthy of you. Interesting, what's the deal here? I love a Delica, and I love some carbon fiber. But this might be too much and the fact that it's hap40 again will probably make this a pass. Looks really nice though, I'll still be jealous as I check out the pictures in this thread. Congrats! I'm actually kind of surprised you don't already have a Sage 2. Thanks! I've had a one and a five but never pulled the trigger on the 2, and currently have no sages. I just got mine in the mail today too, it was also incredibly tight. I wondered however if it was St Nick's that tightened it down before sending it out due to the fact it had to go through customs. Maybe they were trying to help us out. I loosened off the pivot and adjusted it and now its great. I used the last 15% coupon and found it didn't work when I had PayPal selected as payment method but did when I switched to credit card. I'm also looking forward to the Mantra 3, I think it will be a great EDC. Already sold my Sage 5 in anticipation.